The American Eskimo is derived from the Nordic Spitz breed and most closely related to the German Spitz in particular. There were many German Spitzes in the United States at the time of the second World War and anti-German sentiment caused its name to change to the American Eskimo Dog. 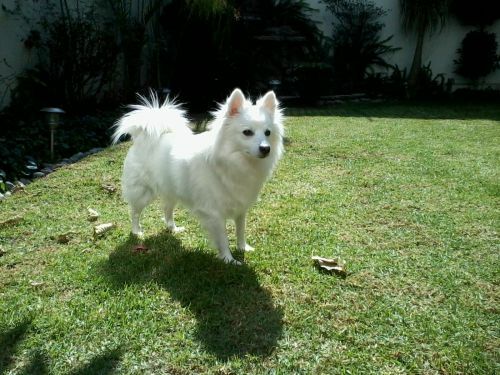 However, as the breed developed over time in the States, the American Eskimo became its own separate breed. 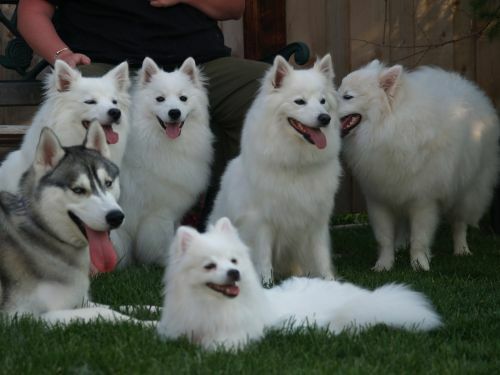 In addition to the German Spitz, the American Eskimo is also related to the white Keeshond, the Samoyed, the white Italian Spitz and the white Pomeranian. The history is beginning to show that the Spitzes that were brought to the US in the early 1900’s was white. This color was not popular in Europe but was quickly the favorite in the United States. They were originally working dogs on farms and ranches. They have excellent herding instincts, make goo watch and guard dogs, and good law enforcement sniff dogs. However, their first introduction to the American public was through the Cooper Brothers’ Railroad Circus and Stout’s Pal Pierre at the Barnum and Baily Circus. Eskimo puppies were sold after the circus show. It was then that the breed became one of America’s favorite breeds and they quickly became house pets. Following World War II, Japan exported the Japanese Spitz into America and it was crossed with the Eskimo also. The American Eskimo Dog breed was not recognized by AKC until 1985. Still in 1958 there was no official breed club in the States but there were growing numbers of the dogs. It was not until 1970 did the National American Eskimo Dog Association (NAEDA) come into being. They collected the pedigrees of the first 1750 dogs to be AKC registered. Since the American Eskimo Dog is not recognized internationally, those wishing to participate in international competition such as England’s prestigious Cruft’s Dog Show must register their dogs a German Spitz. 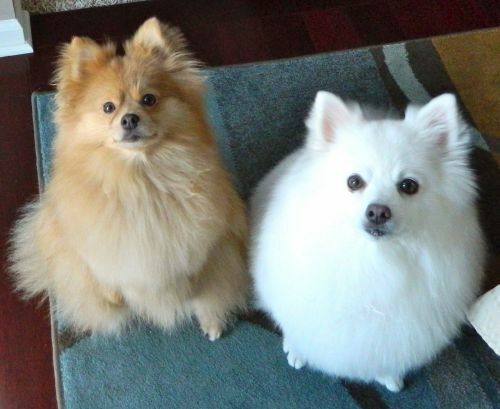 Despite this the American Eskimo and German Spitz remain two very different breeds. As a cross between a Peingese and a Poodle, your cute Peekapoo as he is also known, isn't a purebred dog. They first started making their appearance in the 1900s, in fact it was believed to be developed in the 1950s, being one of the oldest designer dog breeds. He was bred to be a a low-shedding, hypoallergenic companion dog. Both the parent dogs have their own unique, long histories. Dog experts aren’t too sure where the Pekepoo originated from. This dog breed isn’t recognized by the American Kennel Club, because it is a hybrid breed, but it is recognized by the American Canine Hybrid Club. 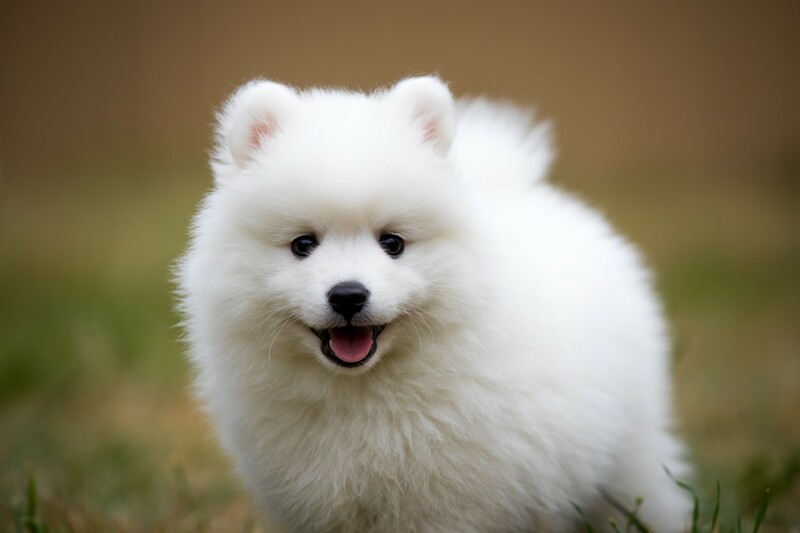 This small to medium dog is beautiful and resembles a miniature Samoyed. There are three sizes of American Eskimo – the standard, miniature, and the toy. The Eskimo’s head is wedge shaped with tall, triangular, erect ears. It has a heavily plumed tail with a sharp curl over the back. The Eskimo can burst into bold action due to their good legs and feet. The coat is a double one with a harsh outer coat and plush inner one. The coat is always white or white with cream or biscuit markings, and visible skin in gray or pink. The American Eskimo’s ruff or mane is very heavy, and the nose, eyelids, pads and gums are black. They have dark eyes and blue are not allowed. People love these little dogs because of their lack of shedding and it having a hypoallergenic coat. The coat is soft and can be wavy to curly with some feathering around the ears and tail. It is medium length and comes in a variety of colors such as fawn, cream, white, black, apricot or chocolate. The coat can have a mix of some of these colors too. This is a small dog that stands at between 23–26cm and weighs in the region of 4 to 9kg. He has floppy, low set ears and bright brown eyes. They're such cute little dogs, loving and loyal to their human family. However, there is another side to them and they can be independent, aloof and stubborn. They’re very intelligent little dogs and will require both mental and physical stimulation to prevent boredom. Because’s he’s so smart, you won’t have any trouble training him new skills. He’ll do well with children in the home as well as with pets, especially once he’s been trained and socialized. He is able to settle into life in the city or the countryside. Even though he is a small dog, he will have to have his share of exercise if he is to remain healthy and content. They are dogs that love to be cuddled and petted ad he gets along well with everyone in the family. Even though he is a true family pet, loving and loyal, he becomes a good watchdog too as he wants to protect all those he loves. The American Eskimo Dog is prone to hip dysplasia. Their eyes and tear ducts are potential issues with progressive retinal atrophy. They are allergic to fleas and have a tendency to be overweight. We deal with PRA (Progressive Retinal Atrophy in greater detain in a following section but it is not as destructive as it used to be. It is much more treatable now. There are potentially some dental issues that soem American Eskimo Dogs are prone to. As with any dog, there are certain common dog ailments that you want to watch out for in your Pekepoo. Brachycephalic airway syndrome is one as well as dental disease and obesity. Because your Pekepoo has a somewhat squashed face, he may have abnormalities in the upper airways. Dogs with this syndrome have heavier breathing than other dogs and he might even have a cough. The troublesome part is that these breathing difficulties can put pressure on the cardiovascular system. Small breed dogs are always at an increased risk of being obese and being obese can mean your dog possibly developing osteoarthritis, diabetes, cardiovascular disease, high blood pressure as well as other diseases. Your American Eskimo Dog needs a high quality food so they will not get overweight. Make sure you know how much is appropriate for your particular dog and her specific age. The puppies should be fed twice a day but adults only once. As previously mentioned the American Eskimo Dog is prone to eye issue such as Progressive Retinal Atrophy or (PRA) – this disease is inherited and used to cause blindness as the rods in the retina died. New medical discoveries mean this is no longer a hopeless disease. Their eyes are also susceptible to other issues so make sure you check them and the tear ducts regularly. 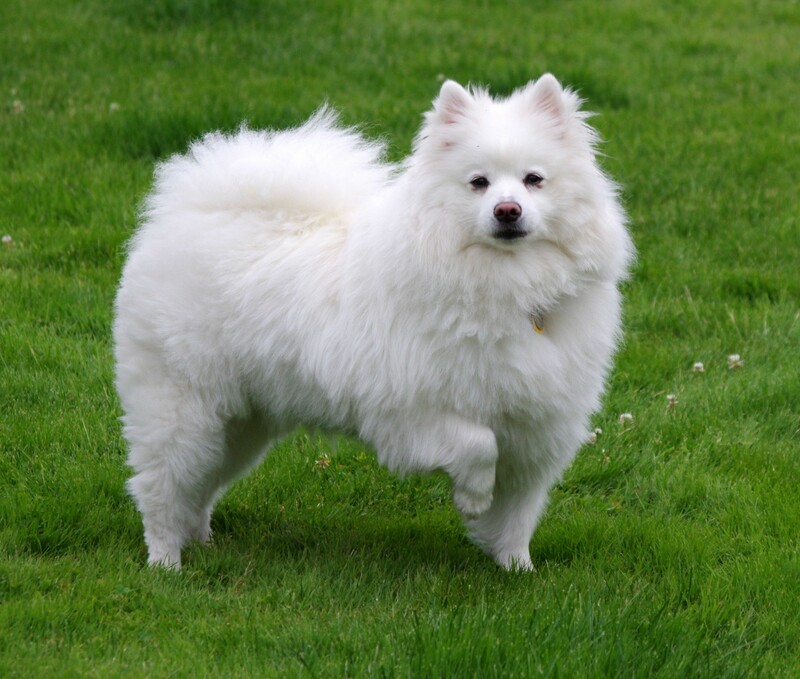 Like so many other breeds the American Eskimo is also susceptible to hip dysplasia and a moving patella in the knee. For this reason watch their weight. They can also be very allergic. This small dog has more energy than his size can handle. He needs a lot of exercise and a place to run. If he will become hyperactive and destructive. They are prone to disturbing behaviors such as spinning (spinning in circles) when they don’t get enough exercise. The American Eskimo Dog is smart and agile, Play games like catch or agility. They are also great at herding, competitive obedience or detection. Your small designer Peekapoo will do well on a high quality kibble diet. Always check out the packaging and see how much to feed a small dog like this. It is better to give a dog 2 smaller meals a day as composed to one because with one they tend to gobble it up which can lead to a serious condition known as bloat. Dogs love simplicity and consistency with their food, but it is always to your dog’s benefit to feed him some home-made food too. Some chopped up boiled chicken, brown rice or pasta and some vegetables such as spinach, carrots and sweet potato added into the kibble occasionally will do him the world of good. Every now and again a little bit of raw meat can also be given. Never leave your pet without a bowl of fresh, cool water. Lively and energetic, your Peekapoo is going to need daily exercise. He will love the chance to sniff around and explore on your daily walks but he is ready to become more involved than that and will join you with hikes and swimming too. He is happiest when spending activity times with his human family. As with any dog, just make sure he doesn’t overdo it, especially on a hot day. To keep your Pekepoo’s hair tangle-free, you’ll need to brush it twice a week. If you feel that his hair is getting too unruly, you can take him to the doggy parlor and have it trimmed into a shorter style. They’ll clip his nails at the same time, check inside his mouth for any signs of dental disease and check inside his ears too for dental infection. The Eskimo is affectionate, playful and love children of all ages. They are intelligent and want to please you. They can be trained easily and are champions of the obedience trial. They are fun and confident. At the same time, they need a confident pack leader. He is prone to Little Dog Syndrome where the dog thinks they oversee the home and display all sorts of behaviors. Under these circumstances the American Eskimo can become obsessive, aggressive, and engaging in obsessive resource guarding and barking. Your Pekepoo is such a gentle, sweet dog, making the perfect family pet. He is gentle, loving and amicable with his human family and wants to be involved in all their activities. Coming from the Poodle and the Pekingese, he will have inherited some personality from each of these two popular dog breeds. He is coming into your home ready to make you a splendid pet and companion and he asks nothing more than good care from you as a responsible dog owner.